TIA Data Center Workshop and 7x24 Exchange Delaware Valley Chapter Meeting. Both had excellent discussions about the role of optics in the data center. The panel I moderated at the TIA Workshop had representatives from Microsoft, Google, Dell and Sumitomo. The discussion brought home to me the fact that there is a large gap between the needs of the small, medium and even large enterprise data center and the needs of Internet Data Centers. The chart below, that was provided by Dell, tries to summarize the point. Here in 2014, we still have many enterprise data centers that run 1G servers with uplinks of 10G. At the same time, Microsoft is moving from a combination of 10G and 40G servers with uplinks of 40G and 100G, to pushing for 25G servers to connect to one 100G top-of-rack (ToR) switch-port (a breakout cable). And, Microsoft is also currently working on 400G and above for the rest of its data center network. Clearly a vast difference in Ethernet application. 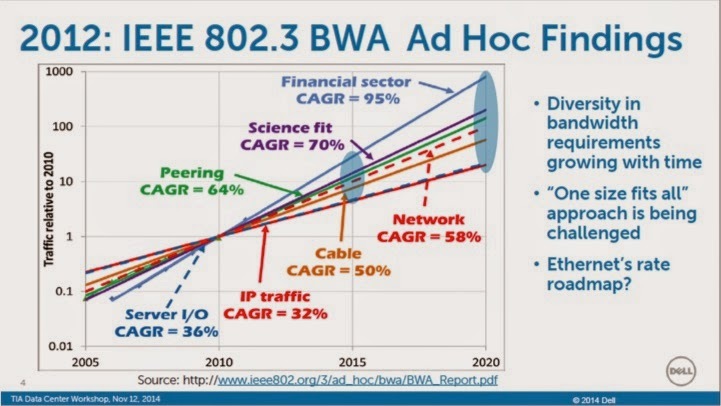 The diversity of data center needs will continue to broaden over the next five to ten years so the IEEE is trying to address this in its Ethernet standards development. Data rates like 2.5G, 5G, 25G and 400G are now being considered in order to address both ends of the market "spectrum." Pun intended. At the 7x24 Exchange Delaware Valley meeting, I discussed this trend and more from our recent study on data center optics. Here is a link to a copy of the presentation. More to come later on trends in data center optics.